Exception notifications are the most difficult of all notifications to describe and to understand. This topic describes exception processing and explains how the profiling API handles various types of exceptions. Exception processing is inherently complex. 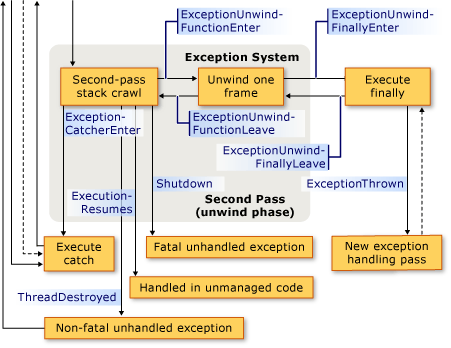 The exception notifications described in this topic provide all the information that a sophisticated profiler requires to keep track of the pass (search phase or unwind phase), the frame, the filter, and the finally block that is executed for every thread in the profiled process. Exception notifications do not provide any ThreadIDs, but you can call the ICorProfilerInfo::GetCurrentThreadID method to discover which managed thread has thrown the exception. The following illustration shows how the code profiler receives various callbacks when it monitors exception events. Each thread starts out in the normal execution state. 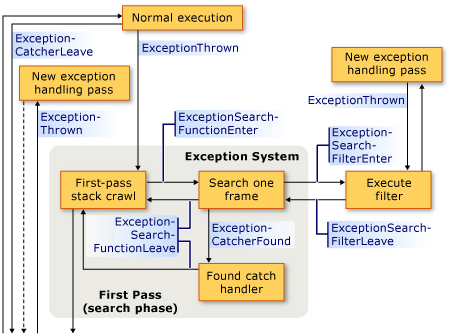 When the thread is in a state inside the exception system (in the search phase or unwind phase), it is controlled by the exception system. Any non-exception-related callbacks (for example, ICorProfilerCallback::ObjectAllocated) that occur while the thread is in one of these states may be attributed to the exception system itself. When the thread is in a state outside the exception system, it is running arbitrary managed code. If the nested exception occurred within a filter block and escapes the filter block, the filter will be considered to return false and the first pass will continue. If the nested exception occurred within a finally block and escapes the finally block, the original exception's processing will never resume. If the nested exception occurred within a catch block and escapes the catch block, the original exception's processing will never resume. An ICorProfilerCallback::UnmanagedToManagedTransition callback when the unmanaged code calls or returns to managed code. Thread termination (if the unmanaged code was at the root of the thread). Application termination (if the unmanaged code terminates the application). An exception might be handled by the common language runtime (CLR) itself. In this case, the profiler will see the unwind phase but will not receive notification of catch handlers. It may see execution resume normally in managed or unmanaged code. By default, an unhandled exception will lead to process termination in the .NET Framework version 2.0. You can force adherence to the .NET Framework version 1 exception policy by using an application compatibility flag, as described in Exceptions in Managed Threads.